Long-lasting Life - 50000+ working hours. Easy installation, just plug andamp; play. 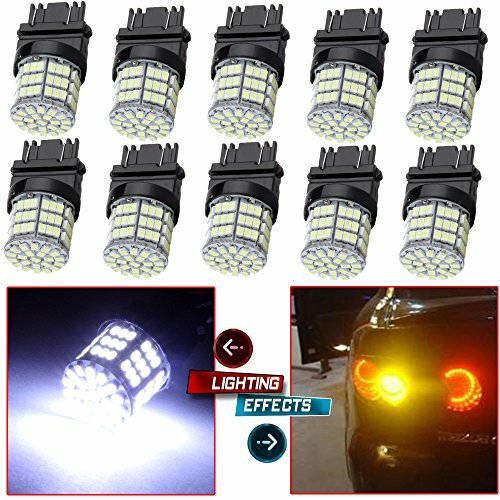 Tail Light, Brake Stop Light,Backup/Reverse Light,DRL,Day Time Running Lights, etc. - Since the nature of the item being offered might fit a large variety of different vehicle and function. - Latest European band cars may need to use built-in Canbus Led to avoid the error code. Application: Tail Light, Brake Stop Light, BackupReverse Light, DRL, Day Time Running Lights, etc. IMPORTANT: Our bulbs come with Standard Base, NOT CK Type. Don't put standard bulbs into CK type sockets. It may pop the fuse or blow the bulb. Or the bulb will light up amber ONLY. Use a electroprobe to check where the two Positive Points locate in your stock socket.You can also buy a pair of standard sockets to modify the wiring.